GOLD has been rallying, but it had little to do with Russian geopolitics, or even trade war fears, which have subsided somewhat in the past couple of weeks, writes Frank Holmes at US Global Investors. 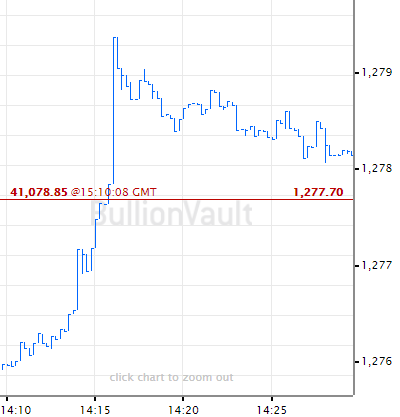 Instead, the price of gold has been responding primarily to a weaker US Dollar. For the 30-day period, the greenback has dipped close to 20 basis points – for the year, more than 11%. I think what's also driving the yellow metal right now are concerns over the US budget deficit and ballooning government debt. 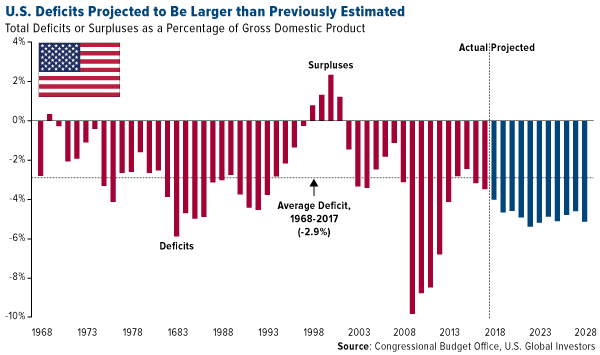 This week the Congressional Budget Office (CBO) said it estimated the deficit to surge over $1 trillion this year and average $1.2 trillion each subsequent year between 2019 and 2028, for a total of $12.4 trillion. By the end of the next decade, then, debt held by the public is expected to approach 100% of US GDP. According to the US National Debt Clock, government debt now stands at over $21 trillion – or, put another way, $174,000 per taxpayer. Imagine what the interest payments on that must be. The CBO, in fact, commented on this. 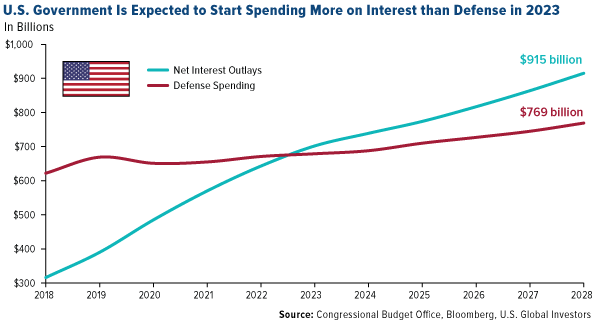 Believe it or not, the government's annual payments on interest alone, made even more burdensome by rising rates, are expected to exceed what it spends on the military by 2023. And remember, defense is one of the country's top expenditures, alongside Medicare, Medicaid and other entitlement programs. You can probably tell where I'm headed with all of this. Savvy investors and savers might very well see this as a sign to allocate a part of their portfolios in "safe haven" assets that have historically held their value in times of economic contraction. 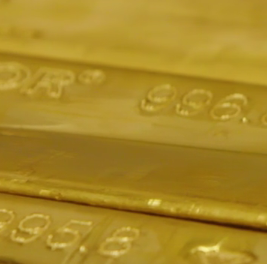 Gold is one such asset that's been a good store of value in such times. As I've shown before, gold has tracked US government debt up since 1971, when President Richard Nixon ended the gold standard. 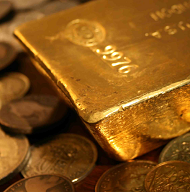 I always recommend a 10% weighting in gold – 5% in bars and coins; 5% in high-quality gold stocks, mutual funds or ETFs. On a final note, I think it's important that investors remember to stay diversified, especially now with volatility hitting stocks and geopolitical uncertainty on the rise. I've discussed Roger Gibson's thoughts on asset allocation with you before, and I believe his strategy still holds up well today to capture favorable risk-adjusted returns. 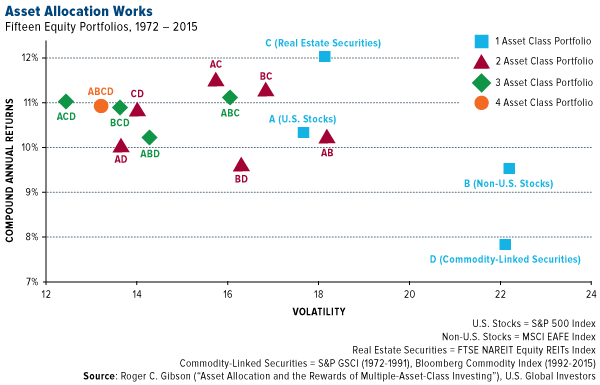 In the chart above, based on Gibson's research, you can see that a portfolio composed of US stocks, international stocks, real estate securities and commodity securities gave investors an attractive risk-reward profile between 1972 and 2015. This diversified portfolio, represented above by the orange circle, delivered good returns with a digestible amount of volatility, compared to portfolios that contained only one, two or three asset classes. 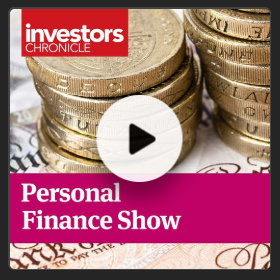 Concentrating in only one or two asset classes could possibly give you higher returns, but you'd also likely see much greater risk, which many investors aren't willing to accept. I believe adding fixed-income – specifically short-term, tax-free municipal bonds – could improve these results. Munis with a shorter duration, as I've explained in the past, have a history of being steady growers not just in times of rising rates but also during market downturns. In the past 20 years, the stock market has undergone two massive declines, and in both cases, short-term, investment-grade munis – those carrying an A rating or higher – helped investors stanch the losses.